DARLENE, best known for her iconic work in illustrating AD&D (1E) and the Greyhawk maps, and I go back a long way together. Even before TSR was buying her art, I was buying it for Dragon Magazine. We share many interests and it was with great delight that I found out about her involvement with this unusual system and that she was “back with us” in the gaming field. TK: So, D, what have you been up to lately? D: I’ve been up to my share of mischief. But what I have on my mind to talk about today is my artistic contribution to a (virtually) new 336-page hard-back fantasy role playing game published last December, 2015. D: The book is called Mythos Arcanum and its game system was inspired by old school D&D. TK: I have skimmed it, mainly to see all the gorgeous art; what makes this different from all of the other clones? D: The author, Joe Aragon juxtaposes modern day rules with allegorical content. It’s different from older fantasy role playing games in that, during the course of the game, it encourages players to explore meaningful self-reflection with their characters. The first concept behind this game is to have fun. Joe Aragon simply broadens the basic package of fun with a new, mind-expanding component. By allowing philosophical queries of illusion and reality to surface, Mythos Arcanum becomes a gateway for young minds to explore the nature of reality. Q: How did you first get involved with the project and the author? D: (laughing) In a chivalric sense and only as an artist. I have never personally met Joe Aragon. He contacted me around 2010 via email asking me to create a logo for his company, Mythos Arcanum Games Imagined (MAGI), which I did. After that, he persistently raised the possibility of me creating interior illustrations for his book. We e-mailed back and forth for a spell. At the time, I was closed to that possibility and tried to communicate my reluctance to return to RPG illustration. Joe pointed out that my endeavors in fantasy illustration were not just relegated to the past. He indicated that a lot of people would welcome seeing new RPG art from me. TK: Wasn’t I telling you that very thing? D: Yes, you were. You pointed out that people still remembered me even though I was out of the loop for 30 years. Many fans honor the Greyhawk maps as classics and still relate to my illustrations as integral and formative to their early gaming experiences. Tim, it’s due to your prodding as much as Joe’s that we are even having this conversation today. You have a leading role in my return to the RPG fantasy scene. That’s why I thought you’d appreciate hearing about my new RPG endeavor. D: Initially, I refused Joe as I had not done any serious illustration work for over 25 years. With a full time job, I felt I did not have the time. Then there’s the fact that monetary compensation for RPG interior art in the industry is notoriously low–at least compared to rates in the real world. TK: What made you finally decide to work with Joe? As in real life, it does not matter if the unfortunate man who met his demise was a thief or murderer. Nothing ever condones the taking of life. The laws of karma are in full play. TK: There have been a few occasions when thinking about our whole genre that I have been somewhat appalled by how casually we shrug off all the killing. I then remind myself that it is all make-believe. This game seems to be a lot less blasé about that. D: The moral lesson (of there being consequences for ones choices and actions) is a vital lesson to learn deeply in today’s world–especially in the case of young players. So yes, I could easily devote my time and energy to produce something worthy and beautiful for the next generation of table top gamers. All could benefit from knowing some key life lessons. That’s why I think this is a fantastic RPG system to introduce to young people and why I went the extra mile. TK: I have a slight issue with his characterization of other games indulging attraction to the sinister, but I still find the premise refreshing. On another note, you mentioned being worried about starting back up with doing illustrations. How did that go? D: Well, I got off to a very shaky start. That was five years ago. I was the opposite of prolific. I think I astounded Joe with my snail pace, averaging about one illustration every moon cycle. Since I had not touched pen to paper in years, it took me a while to get acclimated enough to find my groove. Once I finished the art, I scanned it. Usually, this is the final step, but I found it was but the first. Dogged by the perfectionist within me, I found myself “cleaning up” imperfections on the scanned electronic version. I’d readjust the proportions of figures, alter backgrounds and props, re-crop, re-define, and sharpen the lines. TK: So you like using the computer. D: Like it? My computer is more than an artistic tool. I love the fact that I can zoom in really close without straining my eyes physically. The best part is the computer’s ability to “undo” strokes–which is impossible with ink on paper. Also, with the computer, I can contribute a lot more detail. In a piece of art, I love to balance richly textured areas with non-detailed areas. I seem to use the mouse in the same way I use a pen. TK: Wait a moment–you don’t use a stylus? Don’t all computer artists use those? D: Apparently not. I never invested in a stylus. I forget the reason. I simply learned to use what was at hand to work with. Every dot and every line equals one mouse click. It’s no different than the pointillist technique I did during the day, and takes about as long. TK: Let me get this straight; you’re saying that all of your art in this gorgeous book was done using just a mouse? Including this one that looks like a woodcut? D: Good eye! And I mean that in more ways than one. (Happy your eye operation was successful)… Yes, I opted to preserve the mystique of something from yesterday-year. It was not hard because I seem to naturally drift towards doing a woodcut effect anyway. TK: Wow, D–The book is profusely illustrated. D: This was the result of a successful 2014 fall Kickstarter campaign. One of the stretch goals was to have me fill in the gaps. I am not the only illustrator. Between everyone, every monster, racial type, and character class is fully illustrated. 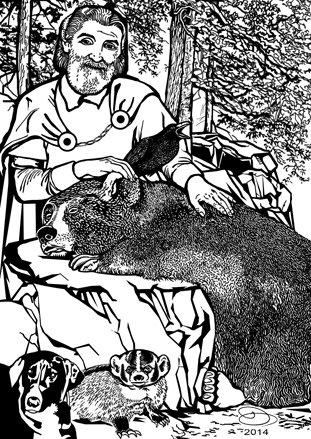 Jim Holloway created the cover art and about 27 of the interior illustrations. The other artists who contributed are Rowena Aitken, Vaggelis Ntousakis, Laura Siadak and Martin Siesto. So all of a sudden, I had a bunch of illustrations to complete in addition to the book’s design. TK: How many illustrations did you do? D: Officially, I created 52 illustrations of various sizes. But while I was designing the book, I thought it would be neat if the Herb Lore section could appear like an old Herbological Guide Book. So I gifted the project with 34 small spot illustrations of plants. Simply to delight the reader, I also created 17 symbolic emblems in the Deity section to fill it out. I think these special little touches entice the imagination. So to answer your question, I did over 100 new illustrations for this book. Q: Isn’t doing all this detailed work time consuming? D: Very. But if something is worth doing, it is worth doing well, don’t you think? The successful Kickstarter helped to free me from the 20th century notion that “time is money.” In that world, it makes no economic sense not to declare a piece of art finished as quickly as possible. That doesn’t work for me. Time is art. That’s my new paradigm. I added detail because I love the richness of juxtaposing different textures. Besides, I consider the time I devote on my illustrations to be a gift to my fans. Locked into my work is the spiritual substance of my artistic focus, beneficence and devoted presence which can be felt through the images. Sensitive players can touch Joe’s strange and beautiful World of Rocheron within Mythos Arcanum. TK: You mentioned designing the book? D: Before I came on board with the project, around 2011, the book was technically ready to go to press. However, the previous layout person made all the customary mistakes novices always make when they attempt to design a publication. Even if space is dear, people must avoid starting a new section in the middle of the second column of a left hand page. Equally bad is splitting up graphs and text so that a page has to be turned to glean important information. Amateurs at design also tend to be horrorvacuists (having a fear of white space) so they are compelled to fill up every available area of every page. Unfortunately, this practice produces uninviting walls of text which are a chore to read (decipher). The alternative is to sculpt the white space to improve the reading experience. That’s why I urged Joe to reconsider publishing the book as it was. TK: And you improved upon this? D: Absolutely. I wanted the design for Mythos Arcanum to be the best the industry has yet seen. I took a tremendous amount of care with the design of each page. Stylistically, I adopted the use of a medieval canon as the underlying grid design for the book. This resulted in a healthy amount of marginal white space bordering each page. A page’s superior readability depends on the correct interplay of positive and negative elements and shapes. When plenty of white space surrounds the text, readability always improves. Studies show, when something is more easily read, comprehend is improved. 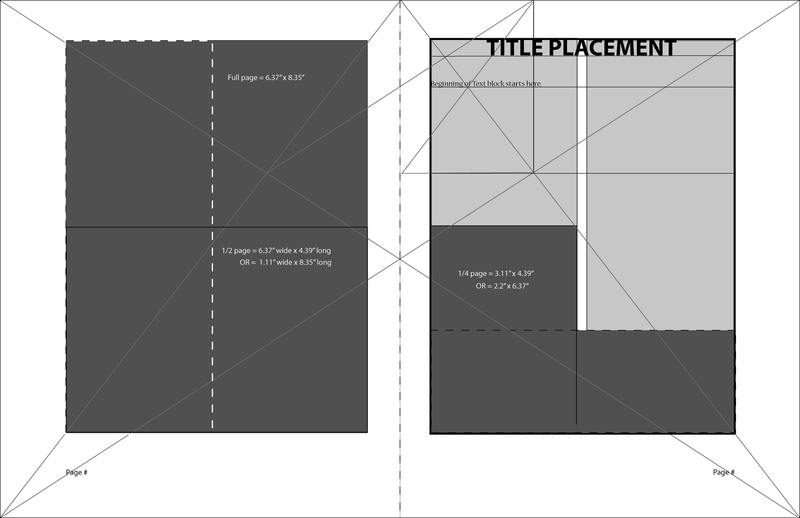 The medieval layout template created for Mythos Arcanum. Another important thing about text columns most beginners don’t understand is the optimum ratio between the size of the font to the length of a line of text it’s set in. The optimal line to character ratio is between 50-60 characters, including spaces. That’s why 12-point type set solid in a one-column format is so difficult to read. The eye too easily loses its place when jumping down to catch the next line. The space between lines should be two points above the point size. TK: Page breaks are sensible. There is an index. Information appears to be easy to find. The illustrations all seem to make sense in conjunction with the text. D: Superior design never calls attention to itself. To serve the meaning of the text so that information is more accessible, great design steps away from the limelight… It’s neutral, invisible, subtle and unassuming. What final things would you like your fans to know? D: I went the extra mile in this book for my fans. I wanted to acknowledge and give something back to them for all their support throughout the years. I also wanted to pay it forward to the future generations of table-top gamers. Thus did I place all my time, effort, sincerity, and breath of creation into what I once considered to be my one final RPG project, my swan song. D: I’m sticking around. I’m staying. TK: OK D, it’s time for your plug. How may people obtain a copy? D: First, I wish to be very clear. The copies I am offering are among those I already purchased from the author. The copies he may have available on his website are not a part of this offer. Since I am selling these books as collector’s items, purchases will directly benefit me as the artist. In exchange for their purchase, people will be getting something special from me. For each book sold, I’ll create a special bookplate (ex libris) to be placed into the book, personalized with the name of the purchaser specially lettered by me. I would also affix my signature to the plate, making this a signed copy. Viola! Instant collector’s item! D: I believe collector’s items are worth more if they remain in their original packaging. Therefore, each book sold would remain shrink wrapped. Each ex libris I personally create will be shipped in the same package as the book. I will spring for priority mail within the continental United States. TK: Thanks, btw, for my signed and personalized copy of the book. There you have it, fans of Darlene’s work. This entry was posted in For the LOVE of BOOKS, New Illustrations, Recent Events and tagged classic D&D, D&D, darlene, joe Aragon, MAGI, Mythos Arcanum, New RPG, RPG Art, tabletop gaming, Tim Kask on May 18, 2016 by Darlene. Very erudite column and observations! Darlene certainly knows her bookmaking. Not every illustrator can boast of that. As someone who worked in the academic publishing field as well as the hobby game field, I appreciate all this. Nice interview, thanks TK!